I'm feeling poorly, looking even worse, and have more congestion up my nose than the gunk tank on Fun House (US peeps, that was a most awesome show when we were kids), but I've still got my lovely Twitteraties keeping me company. For those lovely girls (and guys, Mr Horak!) I give you Rod. (That sounds rude, but Heather, you know I would if I could). Thanks for hanging out with me everyday. Oh as all things do when you're saying something for something's sake, this has now evolved into my love of leopard print. Let's all make more things with leopard print! Look at Rodders working that suit and that hair. Leopard print and big hair is my future, surely? Then there's old Jackie just chilling out by the pool, the contoured cheeks take pounds off her I tell you! And sweet Bette saying "yeah, I'm naked under this leopard print coat, (we'll just think it's faux for the sake of this animal friendly blog) so what?" and who can deny the queen of soap opera, Bette Lynch? And there's Liz, showing us all how to spend time in the pool. Don't swim, just pose. That picture makes me think I'll make the bombshell swim suit in leopard print. Rod's gonna love it next time we hit the South of France. Oh and look at my ex, Cary, trying so hard to give me come-to-bed-eyes in that robe. Oh Cary, we sure had an affair to remember. So, I know Mink Deville has started this with her awesome Victoria blazer rocking the jungle like there's no tomorrow, and I think more animal print is needed in our blogosphere. There was an epidemic of middle aged women wearing it at Rod's concert last week, and I must say, it was a pleasure to see. Nothing screams, I want it, I got it and I don't care what you think, more than some leopard print. So if I feel better tomorrow, I am going to pop to Rolls & Rems in my lunch break and get me some of that hot stuff. 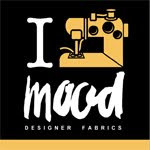 You make me wish I was sewing something with leopard print Right Now!!!! Oh Cary, Clare's done with you so why don't you come over to my place. Meow. Is that what Cary is telling everyone? I dumped him! He's such a cad. But yeah I'm coming over, we'll make leopard print everything! 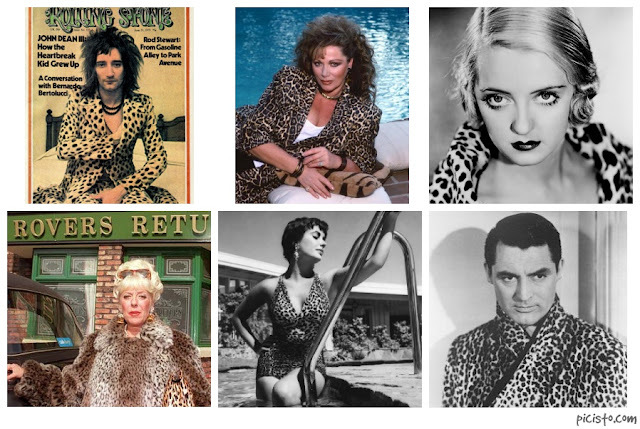 I have a hankering for a shirtwaister in leopard print. I made some doll accoutrements for christmas for my niece last year out of a gorgeous leopard print cotton. It was a small print and "A-ha!" I thought, "that would be perfect for my summery dress." Can I find where I bought it, nope! I know I got it off ebay, but I have been through all my emails, history etc, but cannot find any record of it :-( I guess I shall have to go a-surfin', again. What a hard life!